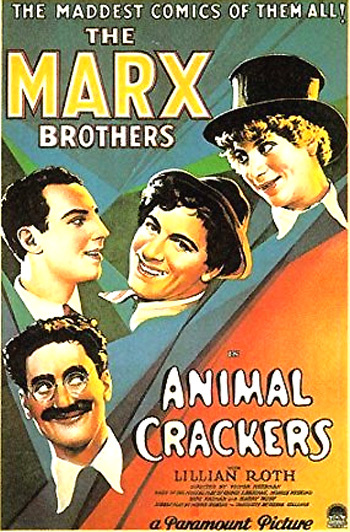 Animal Crackers (1930), the second of many classic Marx Brothers films (their first film was The Cocoanuts (1929), also for Paramount Studios), was the last to be taken from one of their stage successes and the last to be filmed on the East Coast on Astoria sound stages before they transferred to Hollywood. The comic madness of the Marx Brothers in this early talkies-era film is typical of all their films - an intrusive and silly plot - an excuse for numerous verbal ad-libs and elliptical dislocations, criticism of sophisticated and affected high-society life, expository dialogues and battles (notably between Groucho and Chico), and downright funny sequences. In this very talkative, lengthy film directed by Victor Heerman, Groucho established himself with the character of "Captain Spaulding." This farce was loosely based on George S. Kaufman's hit musical play, and developed from a screenplay by Morrie Ryskind. Rittenhouse: I wish you'd get Johnny Parker out of your mind and show more respect to Mr. Chandler. The trouble with you is, you don't take these social affairs seriously. He wants his women young and picked...The men must all be very old, the women warm, the champagne cold. Well, what do I owe ya?...What? From Africa to here, a dollar eighty-five? That's an outrage. I told you not to take me through Australia. You know it's all ripped up. You should have come right up the Lincoln Boulevard. Why, you're one of the most beautiful women I've ever seen, and that's not saying much for you. But the guests persuade him to stay. While the guests continue singing "Hooray for Captain Spaulding," he leaps about, spins, and hops around - rotating like a corkscrew with one leg in a strange wild dance. He also simulates trudging through the jungle. [One of the original lines of the song was censored and abruptly cut because of its sexual suggestiveness for the film's 1936 re-release, and is only rarely heard: "I think I'll try and make her." It came after Mrs. Rittenhouse's line: "You are the only white man to cover every acre."] A few encores of the chorus of the song interrupt his effusive speech of thanks. And that is why we say, Hooray, Hooray, Hooray. Wait a minute. I think you're right. It is pretty bad. As a matter of fact, it's one of the frowziest looking joints I've ever seen....Where did you get your wallpaper? You're letting this place run down, and what's the result? You're not getting the class of people that you used to. Why, you've got people here now that look like you. Now, I'll tell you what we'll do. We'll put up a sign outside - Placed Under New Management. We'll set up a seventy-five-cent meal that will knock their eyes out. After we knock their eyes out, we can charge 'em anything we want. Now, sign here and give me your check for fifteen hundred dollars. Now, I want to tell you, madam, that with this insurance policy you are provided for your little ones and for your old age, which will be here in a couple of weeks now - if I'm any judge of horse flesh. She responds: "Captain Spaulding. You stand before me as one of the bravest men of all time." So he agrees to stand before her: "All right, I'll do that." She continues to compliment him on his bravery and celebrity, but he ungratefully sneers back at her: "Sez you," and faints at the sight of a caterpillar on his lapel. He has to be dragged to a chair to be revived. Spaulding: What do you fellas get an hour? Ravelli: For playing, we get-a ten dollars an hour. Spaulding: I see. What do you get for not playing? Ravelli: Now for rehearsing, we make special rate. That's-a fifteen dollars an hour...That's-a for rehearsing. Ravelli: You couldn't afford it. You see, if we don't rehearse, we a-don't play, and if we don't play (he snaps his finger) - that runs into money. Ravelli: Just-a the cover charge! Ha, ha, ha. Ravelli: Well, let's see how-a we stand. Ravelli: Yesterday, we didn't come. (To Mrs. Rittenhouse) You remember, yesterday we didn't come? Ravelli: Yes, that's three hundred dollars. Spaulding: Yesterday, you didn't come, that's three hundred dollars? Ravelli: Yes, three hundred dollars. Ravelli: Now today, we did come. That's-a (pause)..
Ravelli: Hey, I bet I'm gonna lose on the deal. Tomorrow we leave. That's worth about (pause)..
Ravelli: Yeah, that's alright for me, but I've got a partner. The Professor (Harpo Marx) is introduced as another guest, although his area of expertise is never made clear. He comes down the main staircase with a grand entrance, wearing a black cape (through which can be seen a high-collared silk shirt and bow tie), high top hat, and a cane with a taxi horn on the end of it. Spaulding announces: "The gates swung open and a Fig Newton entered." The Professor blows solid white puffs of cigarette smoke until Spaulding asks for a chocolate variety. Then, he blows out a black bubble. Ravelli compliments him: "He's a-got everything." When the mannered butler Hives (Robert Greig) removes the Professor's cape, and Spaulding quips: "and send for the fumigators," the Professor is wearing only black shorts and an undershirt. Grabbing one of Spaulding's hand-guns, the Professor takes aim at everything and everybody in the lobby, clearing the place quickly. With one of the rifles, he takes potshots at whatever he fancies: the swinging pendulum of the wall clock, the singing pet canary, the hats on the heads of two passing ladies, a champagne bottle carried on a tray by the butler, and a classical Greek art statue of two wrestlers (that comes to life and shoots back at him). His shooting episode concludes when a blonde passes through and he drops the gun and hotly pursues her. In the next scene, the valuable Beaugard painting is hung in the library above the mantle under Hives' supervision. Another female guest, neighbor Mrs. Whitehead (Margaret Irving), schemes with friend Grace Carpenter (Kathryn Reece), because both are jealous of Mrs. Rittenhouse's social prominence. Grace suggests a devious plan of sabotage: "I copied that painting in art school a year ago...I'll go home and get the copy, we'll substitute it for the original, and when she unveils it - what'll she have? An imitation! And I must admit, a very poor one." Mrs. Whitehead gets Hives, a former employee, to promise to do her a "big favor" - temporarily substitute Grace's phony painting for the real Beaugard. John: Last year, I sold two paintings, one at a hundred and one at fifty. Could we live on $150 a year? Arabella: Well, we wouldn't need any money. I've got a charge account at every shop on Fifth Avenue. John: Well, if I had any brains, I'd give up painting and get a regular job. To help her fiancee's dire financial situation, Arabella suggests that Chandler buy one of John's paintings, but John scoffs: "Chandler! Ha! What does he know about art?" Ever since I've met you, I've swept you off my feet. Something has been throbbing within me, oh, it's been beating like the incessant tom-tom in the primitive jungle. Something that I must ask you...Would you wash out a pair of socks for me?...It's just my way of telling you that I love you, that's all. Yes, I don't think I've ever seen four more beautiful eyes in my life. Well, three anyway. You know, you two girls have everything. You're tall and short and slim and stout and blonde and brunette, and that's just the kind of a girl I crave. We three would make an ideal couple. Why, you've got beauty, charm, money. You have got money, haven't you? 'Cause if you haven't, we can quit right now. Spaulding then excuses himself for a "strange interlude" during this marriage proposal scene. He mocks the portentiousness of the theatre and parodies Eugene O'Neill's Strange Interlude with three soliloquies, by speaking in 'interior monologues' directly to the audience. In each one, he starts by stepping forward toward the camera and delivering a monologue, and ends by shooting his eyes up and stepping back. Pardon me while I have a strange interlude. Why, you couple of baboons! What makes you think I'd marry either one of you! Strange how the wind blows tonight. It has a tintity voice, reminds me of poor old Moslin. How happy I could be with either of these two if both of them just went away! He returns to the scene with the ladies and proposes to marry both of them: "Well, what do you say girls, what do you say, will you marry me?...Both of you, let's all get married. This is my party. Party! Party!" Spaulding: Here I am talkin' of parties. I came down here for a party. What happens? Nothing. Not even ice cream. The gods looked down and laughed. This would be a better world for children if the parents had to eat the spinach. (He steps back and proposes marriage to both of them.) Well, what do you say, girls? What do you say? Are we all gonna get married? Mrs. Rittenhouse: All of us? Mrs. Rittenhouse: But that's bigamy! Spaulding: Yes, and that's big-a-me, too...It's big of all of us. Let's be big for a change. I'm sick of these conventional marriages! One woman and one man was good enough for your grandmother, but who wants to marry your grandmother? Nobody, not even your grandfather. Think, think of the honeymoon, strictly private. I wouldn't let another woman in on this. Well, maybe one or two but no men. I may not go myself. Mrs. Rittenhouse: Are you suggesting companionate marriage? Spaulding: Well, it's got its advantages. You could live with your folks and I could live with your folks. (To Mrs. Whitehead) And you, you could sell Fuller Brushes. Yes, but the trouble is, you can't enforce it. It was put over on the American people while our boys were over there and all our girls were over here. When swimsuit-clad young ladies enter laughing and bouncing down a flight of stairs, he apologizes to the two older ladies for having to postpone their wedding for a few days (or years) and then leaves to sow a few wild oats with the troupe of younger chorus girls. The two older women blindly remark as they are both discarded and deserted: "The Captain's so amusing! Isn't he charming?" John: You mean, put my copy in place of the Beaugard? John: Why Arabella, you're crazy. What good would that do? Arabella: What good? Listen, they'll unveil it, Chandler will tell everybody how fine it is, they'll all cheer their heads off, and then we'll tell 'em who really painted it. They'll say you're a great artist, you'll get six commissions for painting, and we can be married and divorced in no time. John: Well, that sounds great, but what if they don't like my painting? What then? Arabella: Well, isn't the chance worth taking? When Ravelli and Chandler enter the library, Ravelli suspects that Chandler - as art collector - is a phony. He recognizes Chandler as Abe Cabibble - a Czechoslovakian fish peddler. When Chandler vehemently denies it, he and the Professor (distracted from chasing a blonde woman) wrestle him to the floor in a search for an identifying birthmark. The large black mark is discovered on Chandler's right forearm. Ravelli asks him how he transformed himself: "How did you get to be Roscoe W. Chandler?" Chandler replies back smartly: "Say, how did you get to be an Italian?" Ravelli ignores Chandler's accurate perception: "Never mind. Whose confession is this?" Chandler tries blackmailing Ravelli with $500 as his "best offer" to keep him quiet about his background. (The Professor eagerly anticipates becoming rich, and rubs his hands together gleefully.) But Ravelli refuses the bribe. Chandler is unaware that he puts the roll of bills back into the Professor's pocket instead of his own pocket. When Ravelli loudly chants: "Abie, the fish man, Abie, the fish man...," Chandler offers a larger bribe - a $5,000 check. The Professor drops it onto the floor to verify it, but it bounces back to his hand - a bounced check! They continue chanting to thoroughly embarrass Chandler. The Professor and Ravelli then decide to steal Chandler's handkerchief, tie, and garters. His birthmark is also stolen - it suddenly appears on the Professor's own forearm.